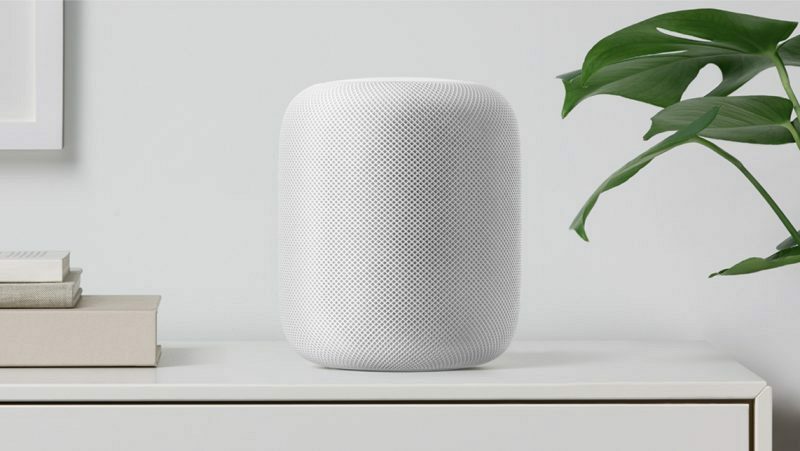 Apple this morning announced the official launch date for its much-anticipated HomePod, and that announcement included several new details that we hadn't previously heard about the Siri-equipped smart speaker. In the HomePod press release, Apple says HomePod can be used as a speakerphone with the iPhone "for crisp and clear audio quality." This means users will be able to take calls on the HomePod using a nearby iPhone, with the HomePod able to serve as a speaker and a microphone for the call. Further documentation shared with Apple Store staff (via Guilherme Rambo) says that this feature will allow "anyone" to make a call on their iPhone and then hand it off to the HomePod. Everyone can continue a phone call on HomePod--Anyone can start a call on their iPhone and hand it off to HomePod for a hands-free conversation. HomePod will not be limited to a single user, as suggested and confirmed in the HomePod documentation. Once the HomePod is set up, anyone in the home will be able to listen to music using the Apple Music account installed on the device, and anyone will be able to ask Siri questions. Everyone can ask Siri questions--Anyone in the home can use HomePod to get everyday information like weather, traffic, new, translations, general knowledge, and more. For example, just as "Hey Siri, what's the weather like this week?" HomePod is primarily designed to work with an Apple Music account, and while it does support Bluetooth 5.0, it's not yet clear if it will support playing music directly to the device from an iPhone or another smartphone. It will, however, support peer-to-peer AirPlay, so you can play content from third-party music apps on the HomePod using AirPlay. Sans Apple Music subscription, though, HomePod will be able to play content that's been purchased from iTunes along with Beats 1 radio content and podcasts. As Apple shared earlier this morning, HomePod will eventually support multi-room playback and stereo sound by linking one or more HomePods together using the new AirPlay 2 protocol, but that functionality will not be available at launch. At launch, HomePod will be available in the United States, UK, and Australia. In the U.S., it will be priced at $349, and it will cost GBP319 in the UK and $499 in Australia. Apple will begin accepting orders for the HomePod on Friday, January 26, with the device set to launch two weeks later on Friday, February 9. I have a feeling this is gonna bomb and it's not gonna be as magical as Phil likes to make it. Does anyone actually use these things? I'd feel I right twerp talking to a machine like it's my best mate. I don't even use Siri because you feel bloody stupid. Is it an English thing? Americans seem to love all this "Hey Siri, Hey Alexa" chirpyness! So, it can do what everyone else does, almost. Not sure it sounds like Apple will do what Google does, and maybe Echo, but while anybody can ask those products anything Google lets you pair user accounts to the Home so that when Home detects your specific voice it will do customize and personalized responses. So if you have multiple users paired to the Home, it will say Hey User X, your commute to work will be 30 minutes or Hey User Y, your commute will take 23 minutes. What this also means if that multiple users have Google Music accounts, they will be able to access their specific playlists. It sounds to me like the HomePod is tied to one Apple Music account, meaning that while it might provide personalized responses for the owner of that account, it does not really support "multiple users". Apple has ALWAYS assumed that a user is tied to a device. They wanted everybody to have their own phones, tablets, laptops, etc. They never implemented multiple user support on iOS because Apple wanted people to buy their own devices, and I think this is going to kick them by introducing a product that will be shared between members of the same family or household. This is the first iOS device that will not be owned by an individual user, but by the household. I think the delay has nothing to do with the hardware, I mean even Apple can't screw up a speaker that bad, but I think the delay was due to Apple trying to shoehorn this product into their existing service limitations, and I think this will be the HomePod's Achilles heal. I just don't think it will do a lot of little things that people already can do with Google or Amazon devices, like actually recognize different users until there are a lot of infrastructure changes to Siri and Apple Music. Sure anybody can come in and ask it the weather, EVERY other device lets you do that, but I don't think Apple has actually implemented the ability to ever know the difference between those users and give it personalized responses. Still sounds like single user to me. Sure anyone can ask something, but assuming I set up the HomePod with my account can my wife ask Siri to play a song from her Apple Music account? Without Spotify support, there's no way I'm gonna buy this thing. Produce a proper "HomePod" with Airport / Time Capsule functionality, and I might be interested. But no... Drop a serious product and bring (late) to the market a speaker with the pathetic Siri. Thanks for that. I'll pass. Once the HomePod is set up, anyone in the home will be able to listen to music using the Apple Music account installed on the device, and anyone will be able to ask Siri questions. ... but what happens if anyone besides the “installed account” wants to use it to send a text? It’s nice that anyone can ask it a question, but does it only support one user for texting, etc? Do you have an iPhone? It too ships without native support for Spotify. But you can stream from your phone to HomePod, so you should be ok.